For years, the Indonesian blue-tongued skink was thought to be the only blue-tongued skink that was not found in Australia. Being of Indonesian origin, it was fair game for the import/export market, making it an affordable import option to the more expensive Australian blue-tongues. 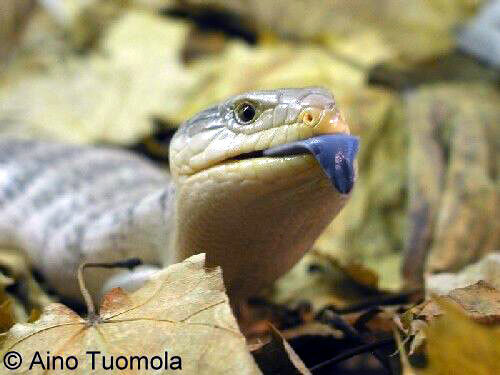 In-spite of its frequent bad disposition, and high mortality rate, the Indonesian blue-tongue maintained a relatively solid place in the blue-tongued skink hobby, due mainly to the fact that it was quite inexpensive. 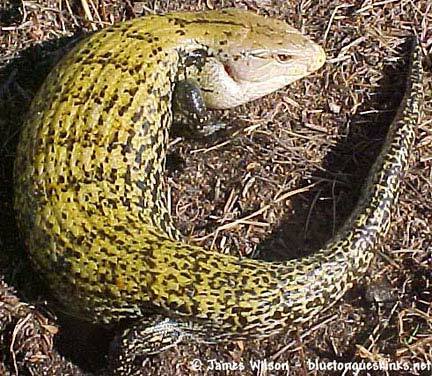 This all changed in the early 90’s with the discovery of another blue-tongue from Irian Jaya, which was soon named the Irian Jaya blue-tongued skink. The Indonesian, and Irian Jaya blue-tongue, are often confused for each other, because of the close proximity of their ranges, and the misuse of their common names in current literature (Both species are often referred to as the New Guinea blue-tongue). Indonesian blue-tongued skinks have a very extensive range that includes many islands, which creates a great deal of variation in color and form. Many of these color variations are thought to be local specific. 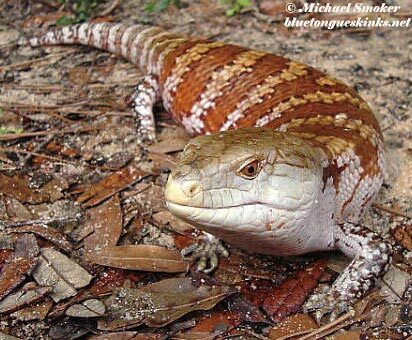 There are currently three recognized subspecies: The Common Indonesian blue-tongued skink Tiliqua gigas gigas, the Merauke Faded blue-tongued skink Tiliqua gigas evanescens, and the Kei Island blue-tongued skink Tiliqua gigas keiensis. Because it has been divided into subspecies, I will also cover this species on the subspecific level. Their coloration varies from light grey to silver with other specimens ranging from gold to brown. Some brown specimens from Ambon and Ceram Island are almost solid black with very little brown showing. The specimens from these two island locals frequently make poor captives, coming in with high parasite loads, and bad dispositions. They are apt to squirm, bite, and defecate whenever they are handled, and they have high mortality rates. On the other hand there are other brown specimens of very similar coloration and pattern, from the Sarong region of Irian Jaya, that make much better pets. The Sarong specimens are docile, quite hardy, and they get a lot bigger. Indonesian blue-tongues are usually banded with thin black bands that may or may not have peppering of the background color in them. One of their distinguishing traits is the coloration of their limbs. Their fore and hind limbs are always black, and may or may not possess a certain amount of white spotting on them. Most specimens also have a large black rectangular blotch on the side of their neck that starts just behind the ear, and extends back just past the front legs. Indonesian blue-tongues usually have a single black stripe on the top of the neck. The ventral surface may be orange or cream in coloration, sometimes with varying amounts of black, forming a reticulated or almost checkerboard pattern. 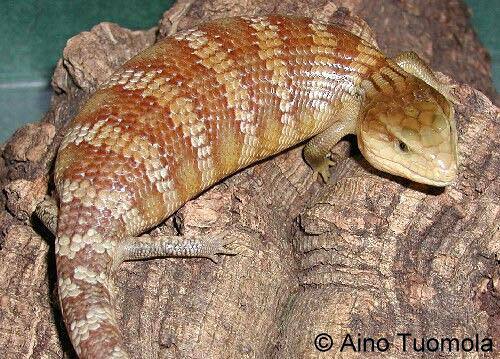 The tail is the longest of all the blue-tongue species, accounting for 85-95% of the snout-vent length. Of course, this is taking into consideration that the animal must have its original full tail. The tail’s banding is usually obscured or totally absent and it is often black with some white, gold, or brown flecking on it creating a granite-like pattern. A broken thin black temporal streak may or may not be present. The anterior temporal scales on the Indonesian blue-tongue are elongated and much longer than the other temporal scales. It is also very common for them to have a black outlining on the edges of the large scales on their heads. Many Indonesian blue-tongues are a bit smaller than the typical blue-tongue, with adult sizes ranging from 17-19 inches (43-48 cm). It is important to remember that a 19-inch Indonesian blue-tongue is usually considerably smaller in snout to vent length than a 19-inch Common blue-tongue. Still, there are some forms that can grow considerably large. Females can produce up to 15 live young. The Indonesian blue-tongued skink’s range includes the sub-humid tropical forests to the arid scrub and grasslands of Northern Irian Jaya, New Guinea, and its many surrounding Indonesian islands, including the Moluccas island chain. There is literature that inaccurately states that their range extends farther west to the lesser Sundas, and on through the Greater Sundas (Java, Borneo, and Sumatra). In actuality, according to current locality data this is highly unlikely, as there have never been any specimens documented in those localities.